Along the stone steps between the sleepy villages of Minuta and Pontone in Scala, you’ll find something a little unexpected. 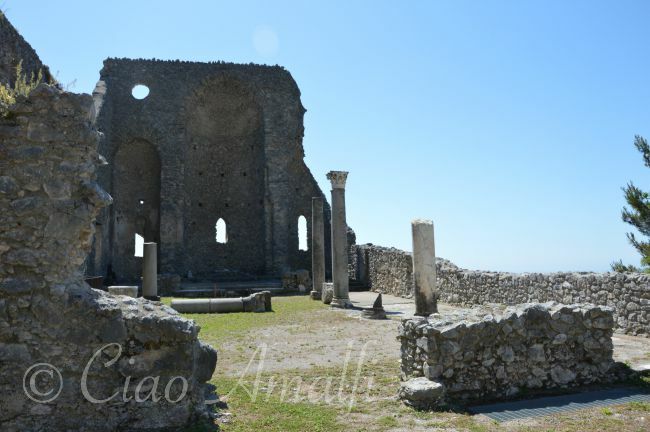 Set in a commanding position on a promontory surrounded by terraces of olive and lemon trees sits the ruins of what was once one of the finest churches in the Republic of Amalfi in the Middles Ages. Following the zigzaging steps down, the remaining walls of Sant’ Eustachio keep coming into view, closer and closer, as you approach Pontone. 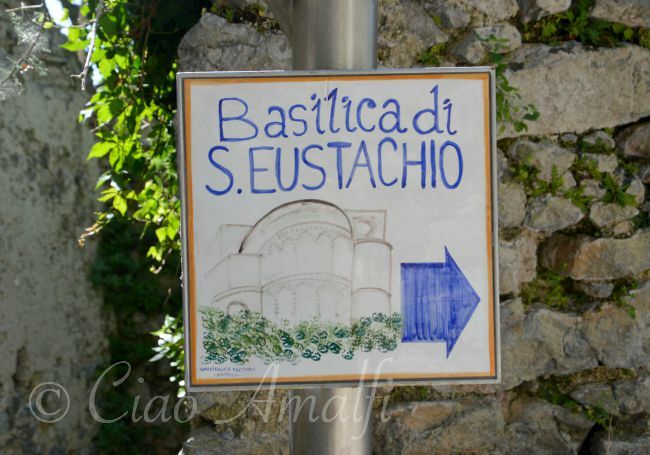 Thanks to a locally run association, you can visit the ruins of Sant’Eustachio, which is beautiful stop on the walk from Scala down to Amalfi. 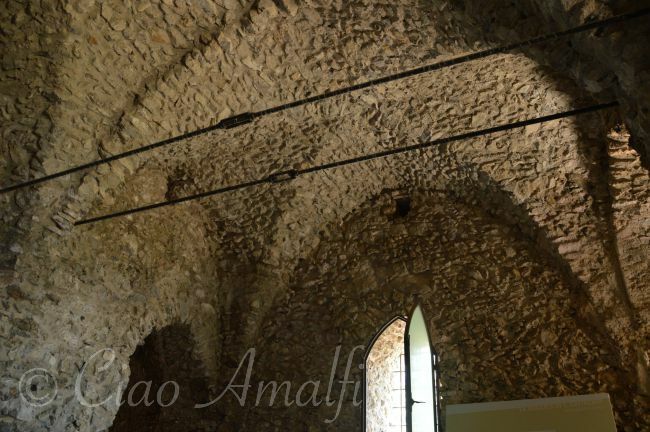 This remarkable church was constructed in the 12th century during the peak of the powerful maritime Republic of Amalfi. 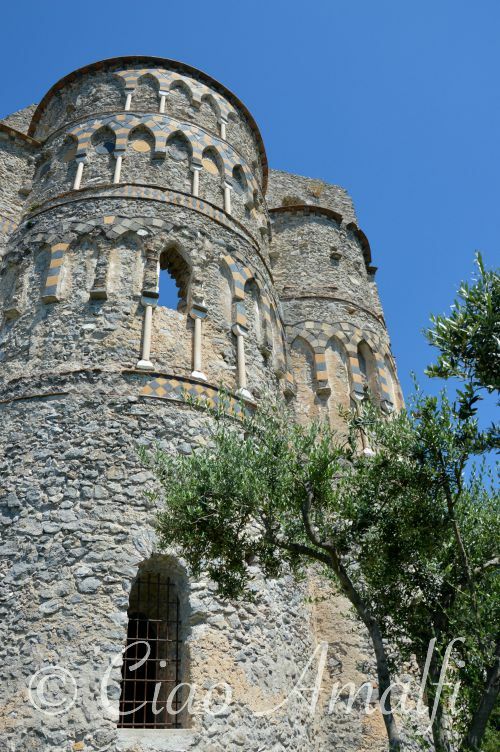 While Pontone is a frazione, or hamlet, of Scala today, in the Middle Ages all of Scala was part of the Duchy of Amalfi. 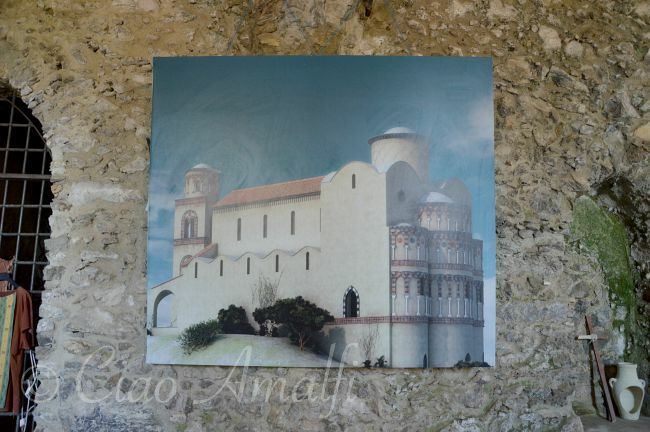 Pontone was home to the prominent D’Afflitto family who constructed this church and dedicated it to a saint important to them, Saint Eustace, an early Christian martyr in the 2nd century AD. When you step into what was once the nave of the church, it’s hard to imagine the original splendor of this church. A pathway leads around the walls of the church where you can stand below the curves of the three apses. 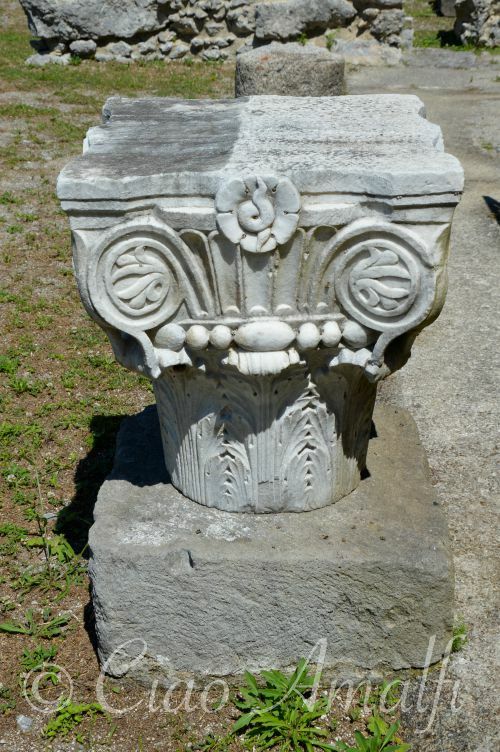 Here there are signs of the elaborate decoration, which has been restored in areas to reveal the original structural polychromy. Staring up at the traces of design and architectural details, it’s easier to see that at its height Sant’Eustachio must have been an absolute jewel. 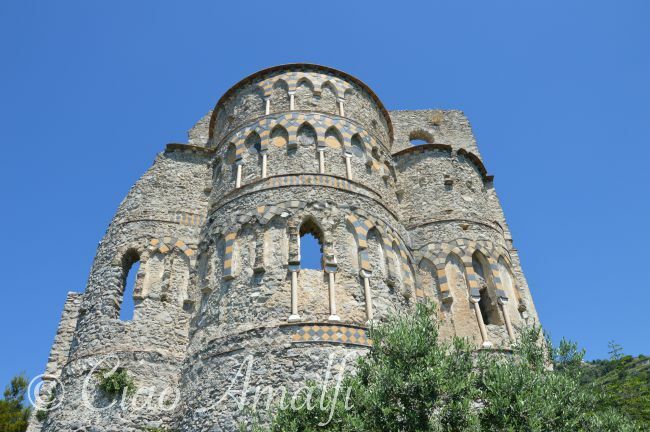 Although in ruins, it is one of the truest examples of the unique architectural style that existed in Amalfi during the Middle Ages – a blend of styles with touches of Sicilian, Arab and Norman influences to name just a few. From this spot high above Amalfi it seems a stretch to imagine traders hundreds and hundreds of years ago crisscrossing the Mediterranean. Yet they did and returned home to build beautiful churches and grand homes high above Amalfi. The setting for one of the finest churches on the Amalfi Coast was naturally chosen for its incredible view. The small promontory juts out between the Dragone and Canneto valleys that run down to Amalfi and Atrani. Peeking through the trees you can catch a glimpse of Amalfi down by the sea. From the tip of the promontory below the ruins the view is breathtaking. 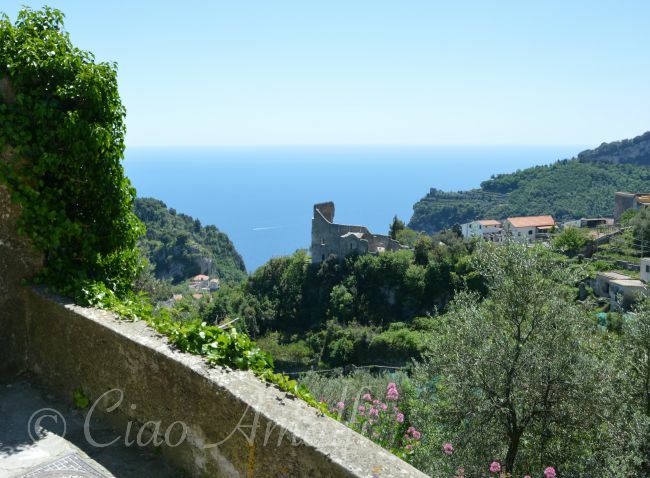 Directly below is Pontone, while down the valley to the right is Amalfi and down the valley to the left is Atrani. Look left and you see Ravello sitting high atop its own promontory while to the right is Pogerola, a frazione of Amalfi. 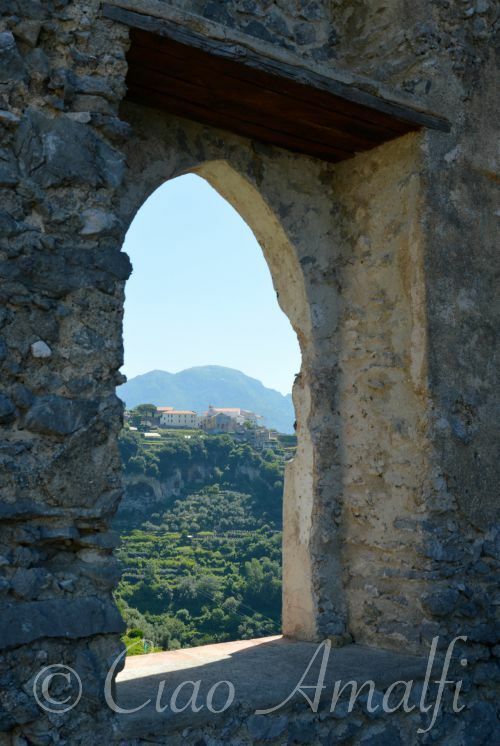 Whether you’re looking at the expansive view or peeking through a window of the ruins to a view across the valley of Ravello, you’ll spend plenty of time just taking it all in. Don’t miss walking down into the crypt, which was one covered with frescoes and was likely one of the most beautifully decorated areas of the church. One wall features a painting that is an architectural rendering of what Sant’Eustachio may have looked like originally. It’s helpful for kicking your imagination into full gear before heading back up to the ruins. Just how might the interior have looked originally? Now there are only a few traces left to help us figure that out. But what remains is incredibly evocative, as is the entire setting. 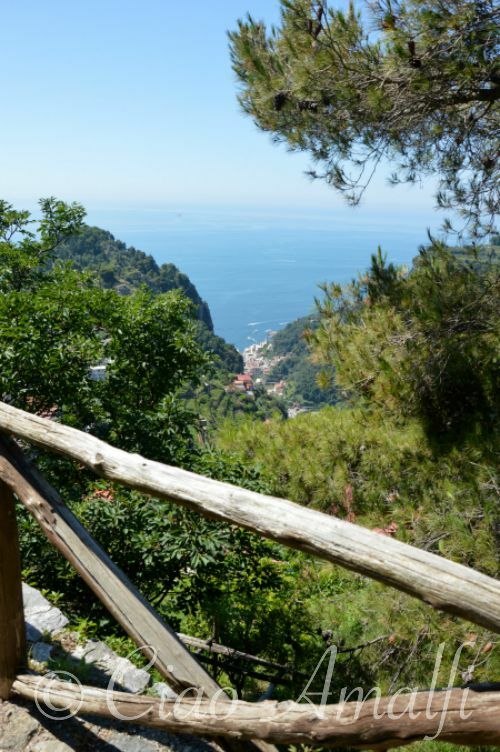 If you’re planning a hike on the Amalfi Coast, one of my favorite is the walk from Scala through Minuta and Pontone down to Amalfi. 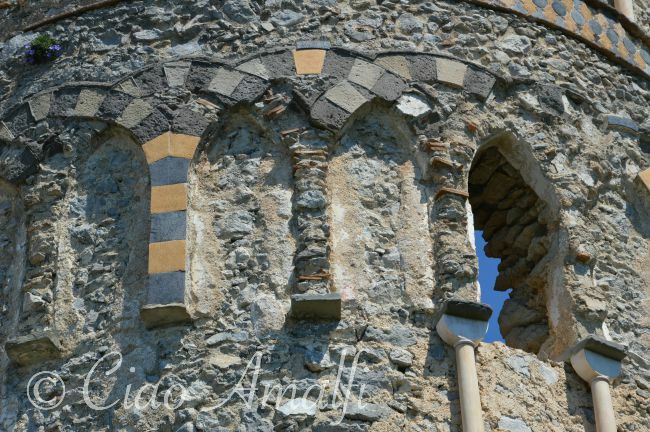 If you follow that hike, do plan a stop in Pontone to visit the ruins of Sant’Eustachio. I fell in love with the Amalfi Coast on a week long holiday (although it really only took one day …) and my husband is a tour guide for the Campania region. This means tours and holiday experiences are both close to my heart and a part of my life. 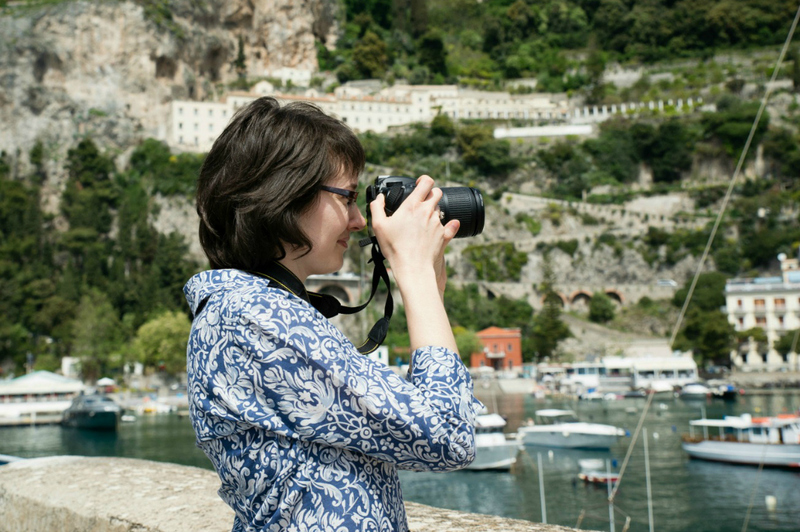 I’m always on the lookout for the best ways to explore and discover the Amalfi Coast, and that’s how I met the amazing team at Flavours Holidays. They offer unique cooking, painting, Italian language and Pliates holidays in some of Italy’s most picturesque spots. 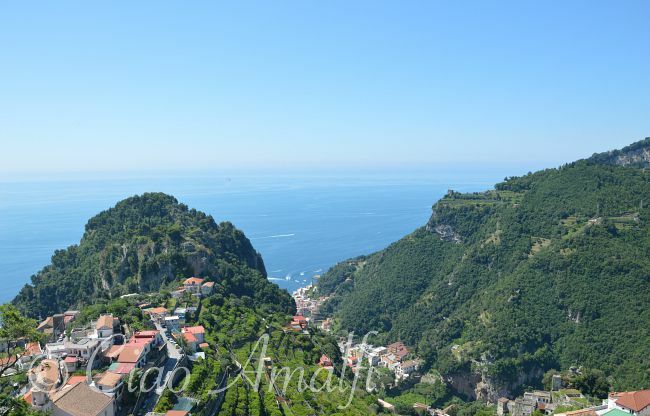 Including, of course, the Amalfi Coast! The team from Flavours have shared what they love most about the culinary traditions of the Amalfi Coast, along with a recipe for a lovely Lemon Mousse! While in the area, be sure to sample lots of seafood and fresh lemon dishes! The region is home to some of the world’s best and most varied seafood. Octopus, molluscs, prawns, sea bream, redfish and more are always served up fresh and with an unbelievable view. Our personal favourite, taught on a Flavours cooking holiday, is a Fish Ravioli. It can be made using your choice of fish or catch of the day and pairs well with a simple sauce with a bit of a kick. Whiskey, butter and cream are combined to create interesting warm flavours. As with many regions of Italy, Amalfi offers its very own pasta cut. The local pasta of Maiori is Ndunderi. This pasta has been listed by UNESCO as one of the oldest types – dating back to the ancient Romans and continues its popularity today. The dumpling shapes make great hearty meals and prove very easy to make for those willing to get hands on in the kitchen. This pasta pairs wonderfully with simple pesto dishes or even just butter and fresh herbs. A rare and unusual regional speciality perhaps worth seeking out is the chocolate aubergine. Yes, you read that right! You may not be convinced that aubergines are a dessert food, but many have changed their mind after experiencing this local delight. Either served cold or warm, layers of aubergine are combined with a dark chocolate sauce, liqueur and pine nuts to create an interesting taste infusion! 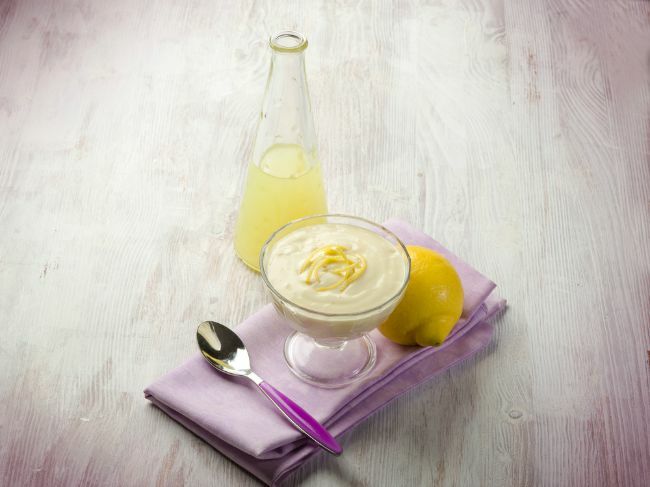 A more traditional dessert from the Amalfi Coast is simple lemon mousse. Another firm favourite on a Flavours cooking holiday, it is perfect for cooling down on a warm summer day. The recipe is easily recreated in your own kitchen, so there is no excuse not to give it a go! Cooking Time: 5 minutes & 1 hr cooling time. 1. Start the lemon mousse with grating the peel of 3 lemons. Juice afterwards. In the meanwhile, soak 4 sheets of gelatine in a bowl of room temperature water. 2. Mix the egg yolk with the sugar and whisk until thick and fluffy. Add some milk and the vanilla. Continue stirring the mixture to avoid lumps. 3. Put mix in a pot and heat slowly. Continue stirring to avoid boiling. 4. When the mix has thickened check if ready by testing if cream sticks to the spoon. When done, turn off the heat and add the soaked gelatine sheets to the pot. 5. Stir again until gelatine dissolves in the mixture. Let cool. Whisk 500 ml fresh cream with electric mixer. 6. When mixture has cooled down, add the lemon peel, juice and whipped cream. 7. Amalgamate it well with a ladle. Use upwards, constant movements so that the compound doesn’t deflate and lose volume. 8. Store the remainder of the whipped cream (100 ml) in the fridge. It’ll be used to decorate the mousse before serving. 9. Let the mix solidify in the freezer for at least one hour. 10. Serve the mousse. Decorate the dish with a bit of whipped cream, lemon slices and fresh mint leaves. Flavours have provided activity holidays to Italy since 1998. Destinations and activity options have expanded since the company first offered cookery holidays, now sending guests on painting, Pilates, cooking and Italian language holidays to five regions of Italy – including the Amalfi Coast. Guests enjoy en-suite accommodation in private villas during week-long breaks. Prices include all meals and wine with dinner, week long tuition in the chosen activity, airport transfers and day trips to local towns and wineries. All week long breaks are priced at £1599, with £100 included towards the cost of flights. Flavours never charge a single traveller supplement.